Just in Case, often referred to as Just in Case Manufacturing or (JIC), is the traditional production model in which finished goods are created in advance and in greater quantities than expected demand. The excess is produced and stocked ‘just in case’ demand suddenly rises or the supply of raw materials and components dries up. JIC is also an inventory management strategy – inventory levels are kept as high as possible. Make-to-stock has a similar meaning, in which the company forecasts future demand and then makes sure it has sufficient stocks (inventory) to meet that demand. Just in Time or JIT is the opposite of JIC. In a Just in Time strategy, stocks are kept to an absolute minimum. When orders come in, raw materials and components are delivered and sent straight to the factory floor. In the 1960s, Japanese car-maker Toyota introduced the Just in Time model, because it was felt that JIC was wasteful, costly and inefficient. Just in Case is a ‘push’ system – the business keeps stocks of inventory and finished goods as high as possible. Just in Time, on the other hand, is a ‘pull’ system in which demand sets the tone of production. ‘Push’ is made for inventory while ‘pull’ is made to order. Just in Case, the traditional inventory-management system, is referred to as a ‘push’ system, while Just in Time is the pull one. Cautious business people say that JIC is helpful because it prepares the company for unexpected jumps in demand or declines in the supply of raw materials and components. They say that JIC allows businesses to offer more options compared to those that use JIT. Companies that use a JIC strategy have to pay more for warehousing and the storage of idle materials. Their stocks are also more likely to become defective or obsolete because they are in storage for much longer compared to those in JIT businesses. In the image above, the ship represents a business. The seawater level represents the commercial enterprise’s inventory, as well as buildings, workers, managers, land and equipment. The rock represents problems the company experiences or may face, including bottlenecks, lack of training, low quality, natural disasters, supplier strikes, etc. Just in Case is a safer, but more expensive approach. Manufacturers in less industrialized nations need to maintain large inventories of parts, supplies, raw materials, warehousing resources and extra employees to meet production contingencies. Where transportation systems are poor, quality control is unreliable, and other environmental, political, economic or infrastructure factors raise the risk of production and delivery problems, a Just in Case strategy is necessary. The manufacturer needs to reorder stock before it reaches a minimum level. If deliveries of supplies are slow, erratic, or stop completely, it needs to be able to continue producing no matter what happens. Stocks of finished products, raw materials, parts and components are kept at high levels in case of emergencies – hence the name Just in Case. – Demand: if an unexpected large order comes in, a company is more likely to be able to supply on time if its stock levels are high. – Raw Material Supply: if supplies of vital components and raw materials required for making the finished product fail to arrive, the business can still continue producing. – Economies of Scale: every time raw materials and components are purchased they are done so in bulk. Bulk-buys are done at a discount, which saves money. – Displays: of finished products are possible because stocks of them are high – this raises the chances of sales. – Space: companies need to spend more money on storage space and warehousing. More space means larger warehouses to rent or build, which uses up money that could be utilized for other parts of the business. – Waste: items are more likely to become obsolete or damaged if they are in stock for a long time. Money is lost because there is more investment in unnecessary stock. – Investment Size: just in case inventory management puts a financial strain on smaller businesses. Having to buy in large quantities is not good for cash flow. – Flexibility: if customer preferences or requirements change, it is not possible to adapt rapidly, because the company is sitting on a pile of stocks. 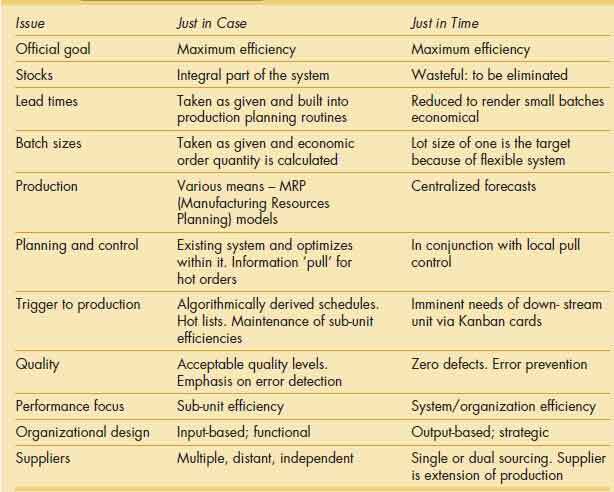 With a Just in Time strategy, where production runs are extremely short, the business can halt production of one good and rapidly switch to another product. – Mistakes: if a mistake is detected after a production run, the business is stuck with a large number of defective goods. With a JIC strategy, production runs are big – which is not the case with a Just in Time approach. If it is not possible to forecast demand, either due to the nature of the business or the lack of skilled personnel and state-of-the art predictive software and simulation models, having a Just in Case strategy is the best option for a company. With a JIC strategy, the company knows it has enough finished goods and/or production material on hand to meet unexpected sharp increases in demand. Experts say that global warming may force businesses to rethink their popular Just in Time business model. The frequency of extreme weather events – hurricanes, droughts, floods, tornadoes, heatwaves, etc. – may make it too risky to keep stock levels down to a bare minimum. The trend now in the United States, Europe, Japan, South Korea and Australasia is to try to strike a balance between carrying the minimum inventory possible, yet never being short of raw materials and finished products. Retailers and logistic firms are beginning to change their supply chains by adding distribution hubs. If there are many well-placed distribution centers, the time and distance spent on the final leg of delivery is smaller. For some businesses, only a Just in Case strategy is possible. If sales are seasonal, as is the case with sellers of Christmas tree decorations, Easter eggs, Halloween costumes, snow-removal equipment & machines, suntan-lotion, and fireworks – the company needs to build up stocks of finished products in order to be able to satisfy demand at specific moments during the year. A Just in Time approach in such cases is not possible. In this video, Dan Martell explains the difference between the two inventory and production management approaches.